Is it possible to post left-eye/right-eye photo links (either crosseyed or wide-eyed) whenever a red/blue anaglyph is posted? Often I watch 3d movies in left-eye/right-eye videos. From an astrological perspective, Harrison Schmitt, as a Cancer born July 3rd, 1935, is the only human so far to set foot on his ruling planet - the Moon. ... which is another great anaglyph. Superb! Milky Waster wrote: From an astrological perspective, Harrison Schmitt, as a Cancer born July 3rd, 1935, is the only human so far to set foot on his ruling planet - the Moon. First, the Moon is not a planet. Then, why do you, apparently an astrologer, come to an astronomer's messageboard, if not to proslytise? I fear your words will fall on stony ground, as bare, stony and infertile as the Taurus-Littrow valley. Unfortunately, it looks like you could only see this in 3D if you looked at it SIDEWAYS! Notice that the red/green parts are separated vertically. Could someone create the more reasonable version for normal viewing? Gary S wrote: Unfortunately, it looks like you could only see this in 3D if you looked at it SIDEWAYS! 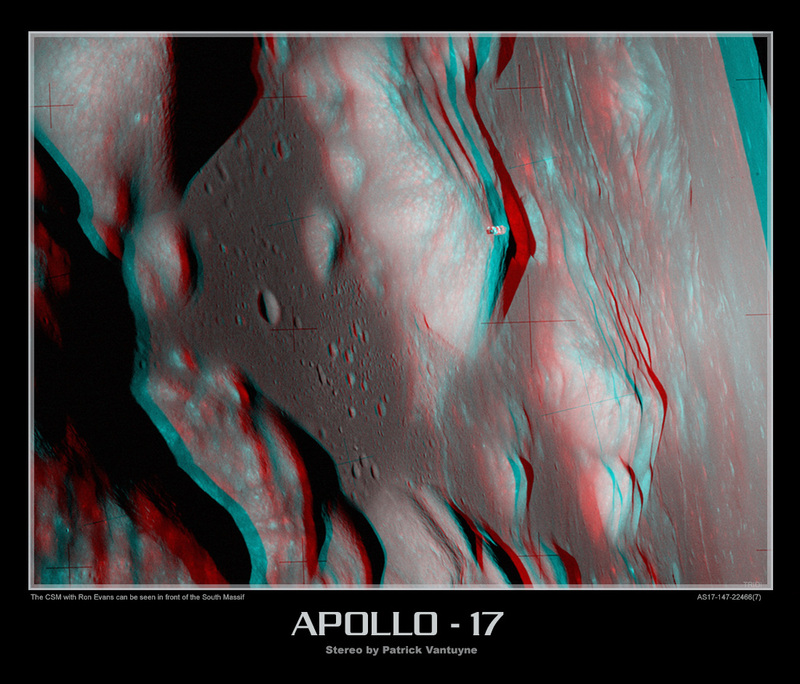 I had no trouble viewing either of these images in their as-shown orientation, using my standard red-blue glasses. I could see it fine, but I think there might be some minor scaling issues between the two frames. I had lots of trouble focusing on the image, particularly the left side. The one posted by Nitpicker is fine. Last evening we were reading through the various theories of how the moon was formed, so seeing this image today was very special. Thank you APOD for bringing us another piece of our astronomy history! Problem: how is it possible that the rover had no license plates, no headlights or tail lights, no wind shield, no horn? That thing sure isn't street legal now, is it? NASA spent millions of dollars making that and they forgot all those things? It seems to me that, since they left it parked there, not only will they get ticketed for all those problems, but they sure are over-parked! The same word can have more than one meaning. The original meaning of "planet", "wanderer" from the Greek, is a celestial object that appears to move against the background of the fixed stars. By this definition, the Sun, Moon, Mercury, Venus, Mars, Jupiter, and Saturn are the planets that have been known since antiquity. After Copernicus and Kepler worked out the orbits of Mercury, Venus, Earth, Mars, Jupiter, and Saturn around the Sun, and Galileo observed moons orbiting Jupiter, planets (including Earth) orbiting the Sun were distinguished from moons orbiting planets. There have been further tweaks after it was figured out that comets are orbiting the Sun rather than being atmospheric phenomena, after the discovery of asteroids, and after the discovery of Kuiper belt objects. Now that we're finding planets orbiting other Suns, and things that look like planets in interstellar space, the definition of "planet" is under new strain and will probably have to be elaborated again. As our understanding of the universe grows, we need to develop our language. But it's also helpful to remember the history of our words, as they hold the story of our understanding. When I'm doing public outreach and somebody says something astrological, I don't spit venom and condemn them as a proselytizing heretic. I try to find a connection between what they're talking about and current scientific understanding. In this case, I might talk about the different meanings of the word "planet." I find you can interest more people in astronomy by understanding where they're at and teaching them something new than by telling them they're wrong, stupid, and evil. That's just my experience, yours may be different. Pluto is a planet. Pluto -- along with Ceres, Haumea, Makemake, and Eris -- is a dwarf planet. New Horizons will hopefully discover all sorts of interesting things about Pluto, but it will not discover that Pluto has "cleared the neighbourhood" around its orbit, because we can tell from Earth that it hasn't. Hence it fails the IAU's third criterion for a Planet. They used Comic Sans for that graphic so it's invalid. Yeah, it should have been on a black background, too, to look like space. It seems kind of strange that for a dwarf planet and a planet one is a planet while the other is not. It's like saying this is a cheese pizza and that is a pepperoni pizza but only the pepperoni pizza is a pizza. Understanding the concept being conveyed, however, it is clear that our vocabulary is limiting us in trying to describe these worlds. geckzilla wrote: It seems kind of strange that for a dwarf planet and a planet one is a planet while the other is not. It's like saying this is a cheese pizza and that is a pepperoni pizza but only the pepperoni pizza is a pizza. Understanding the concept being conveyed, however, it is clear that our vocabulary is limiting us in trying to describe these worlds. Indeed. The mistake the IAU made was in trying to narrow down the definition, when what was really required was a broader, more general definition and a wide set of qualifiers, which could be fairly rigorously defined. What we have now is clearly illogical, and not applicable at all to extrasolar planets, which are by far the largest category of planets we know about. A bit like how Canadians, Mexicans, Brazilians, etc, are not considered to be Americans. Nitpicker wrote: A bit like how Canadians, Mexicans, Brazilians, etc, are not considered to be Americans. Hey, we can't help it that United States citizen is such an awkward and long descriptor so that we have to monopolize the "American" adjective.